Google at the Google For India 2017 introduced Android Oreo (Go Edition) for entry-level Android devices. It also announced that Android Oreo (Go edition) devices will includes optimized apps – Google Go, Google Assistant Go, YouTube Go, Google Maps Go, Gmail Go, Gboard, Google Play, Chrome, and the new Files Go app. Google Go search app is simple to use and fast even on entry level devices and spotty connections, making discovering, sharing and finding content easier and more reliable, says Google. It was being tested as Search Lite earlier this year. It is available as a preview in India and Indonesia. New tap-first user interface helps users better express themselves, explore new ideas, find things to share and guide them around the web. It is less than 5MB to download, and search results in Google Go are optimized to save up to 40% data. It is easy to switch and see answers in another language, for example, between Hindi and English. It is a storage manager that helps you free up space on your phone, find files faster, and share them easily offline with others. Google had been testing it for a month before releasing it for all. 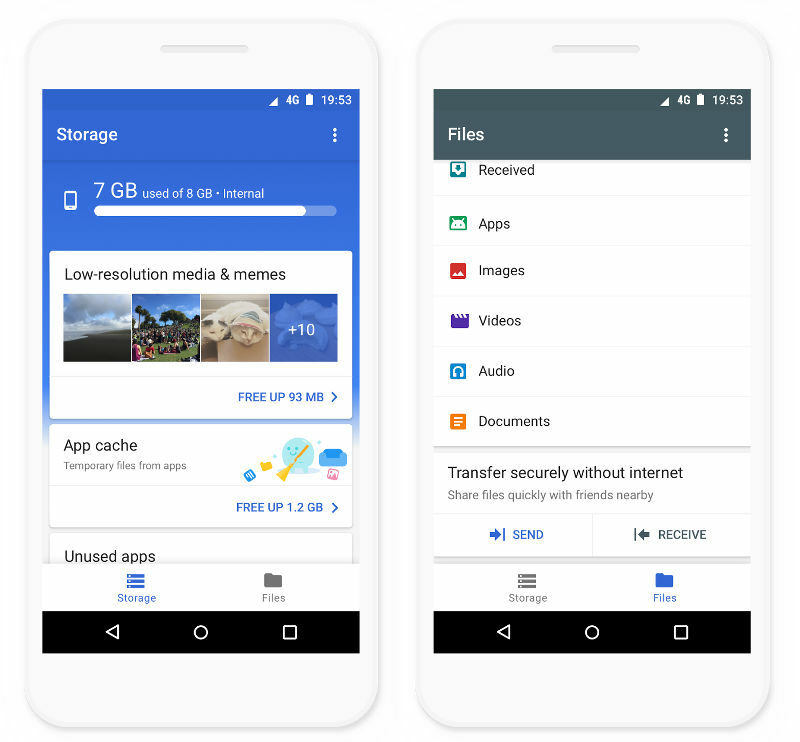 Free up space – Get personalized suggestions about which files to delete, whether it’s unused apps, large files, duplicate files or low-resolution videos and memes detected using Google’s mobile vision technology. Find files faster – Find exactly the stuff you want with smart filters that automatically organize your images, videos, apps, documents and more. Backup files to the cloud – If you want to keep a file forever, select it from the Files menu and back it up to Google Drive or any other cloud storage app. Share files offline – Transfer directly from your phone to a nearby friend’s phone without using any data. The file transfers are encrypted and fast (up to 125 Mbps). It is a new version of Google Assistant built for JioPhone and for India in both English and Hindi. It offers intuitive voice-based user interface, along with a rich set of data services.It can help make phone calls, text, play music and videos, navigate and search the internet, and access other apps and services. 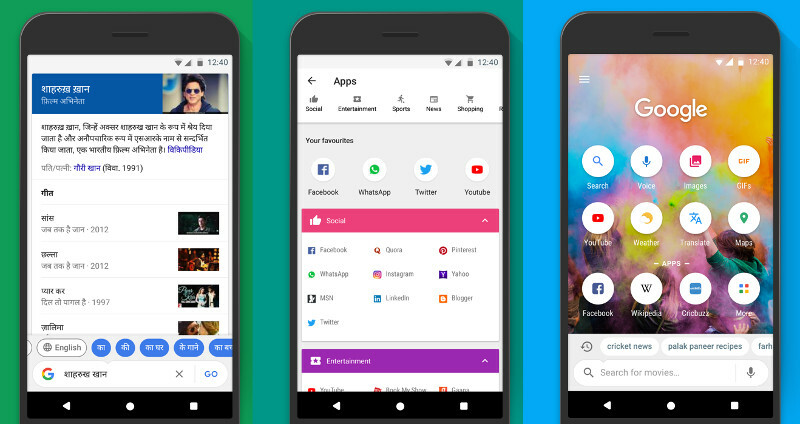 Google Play Store will have a new section for Go Edition devices that recommends popular apps that are tuned to run well on entry-level devices such as Facebook Lite, Skype Lite etc.